There are many archaic safety myths that companies still believe to this day. It is almost like living among hazardous dinosaurs. Does your safety culture belong in Jurassic Park? 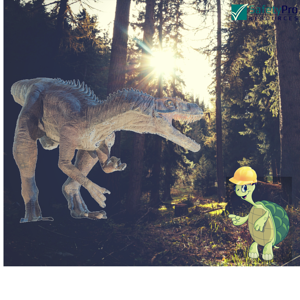 With this upcoming movie, Jurassic World, we decided it might be a good idea to share some of these archaic myths of creating an effective safety culture, and how to counteract them before you end up eaten by the dinosaurs. As children, our parents protect us from harm because we do not know any better; they hopefully give us the necessary training to go out into the real world. Likewise, workers do not automatically know all the safety rules and regulations as soon as they get hired for a job. Training, coaching, and proper supervision are necessary to create a safe environment. This is perhaps one of the main dilemmas of current industrial and construction companies. Some companies will have the necessary documentation on a shelf left to collect dust. It is important to recognize that safety is more than a “paper program” or having the equipment on site, it is necessary for workers and supervisors to have the proper training in order for the job to be done correctly and safely. The bottom line is vital for a growing business, but this does not mean it should compromise the health and safety of your workforce. Many companies see having a safety program as an added expense that isn’t worth it, especially if it is a small company. However, the cost of dealing with injuries, fatalities and OSHA citations highly out weight the cost of having a complete safety program in the long run. Being proactive is always better than being inactive. Not to mention starting with an extensive safety and training program can better your scores on sites like ISNetworld®. Many believe safety belongs to the role of the safety manager or other higher role and it does not affect them. However, everyone in the company must play an important role in safety culture. From workers taking the necessary training and following through on what they have learned, to employers purchasing the necessary equipment to get the job done correctly and efficiently. Understanding everyone’s role as part of the safety team can lead to a more successful and happy workplace; working hand-in-hand to ensure that everyone gets home safely at the end of every work day. As a company looking to start or rebuild your safety program, you must look at the most up to date standards and see what is necessary for your industry. Make sure all of the policies and procedures are in place and begin to schedule the necessary training for all staff involved. For more information on what it takes to have up to date training, download our free eBook on effective training.